This book is perfect for leaders across the enterprise who have a difficult time attracting, retaining, understanding, communicating with, motivating, engaging, and otherwise developing their millennial employees and job candidates. Diving deep into millennial psychology and language using a potent blend of data and anecdotes, stories and history, What Millennials Really Want from Work and Life debunks the many myths around millennials pushed by sensationalist media, showing how millennials want many of the same things as other generations, just more quickly and in a different order and form. Giving helpful context based on his own powerful and unlikely story of continuous struggle and overcoming massive challenges as a millennial, the author weaves a compelling narrative through the historical, psychological, linguistic, and other threads under- lying the millennial experience at work and in life. 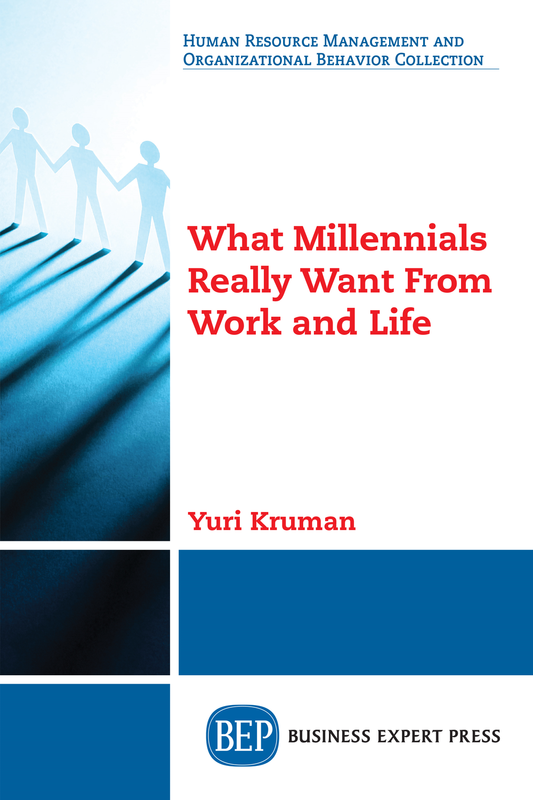 Based on his in-depth analysis of data and trends, Kruman makes specific recommendations for corporate leaders looking to get—and keep and develop—top millennial talent into their ranks, diving deep into specific benefits, communication methods and tools, mission and vision, and other elements of branding relevant to millennial attraction, engagement, and retention. This book is likewise for early and mid-career millennials looking to better under stand themselves and make compelling cases for improvements around the aforementioned in their own companies. Yuri is a corporate Employee Experience (EX) Consultant, board member, startup advisor and official member of the Forbes Coaches Council, as well as contributor to Forbes, Entrepreneur, Business.com, Influencive and numerous other top platforms. Yuri’s consulting, advising and coaching portfolio includes speaking engagements, workshops and advisory work on personal + professional development focused on Employee Experience (EX), HR Transformation / Change Management, Customer Experience (CX), PR/Media and business strategy, impacting thousands of Fortune 500 and startup executives. A regular guest on top podcasts such as Entrepreneur on Fire, Wharton Business Radio, As Told By Nomads, Conscious Millionaire and The Blind Entrepreneur, he’s also been published or featured on Inc., Fast Co., Time, Mashable, PBS, BBC and numerous top blogs, TV and radio. In his corporate work, Yuri trains client teams on ways to maximize their EX, especially talent retention, learning and development using storytelling, branding and proprietary personal development strategies.